WOKING Gymnastic Club gymnast Jamie Lewis was flying the flag for club and county at this year’s Junior European Championships in Glasgow (9-12 August). 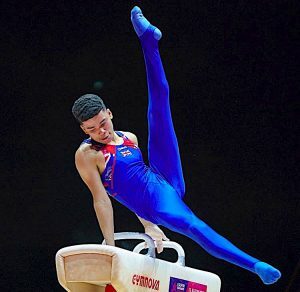 The reigning under-18 British (Men’s Artistic) Champion joined Pavel Karnejenko (Notts Gymnastics Academy), Adam Tobin (Falcons Gymnastics Academy), Jake Jarman (Huntingdon Gymnastics Club) and Donell Osbourne (City of Birmingham Gymnastics Club) to complete the junior GB team. Lewis (13.733) and Karnejenko (13.500) best impressed on the floor routine, and qualified for last Sunday’s apparatus final in first and sixth respectively. Competing on his favoured pommel horse, Lewis was again in inspired form; showcasing his supremacy to score 13.833 to qualify in top spot. And while the 17-year-old Woking gymnast could only manage to finish fourth on the rings, he still managed to reach three finals last Sunday. In Sunday’s finals, Lewis produced three clean routines to conclude his last ever junior competition. silver overall; narrowly missing out on gold to Nicola Mozzato (Italy).